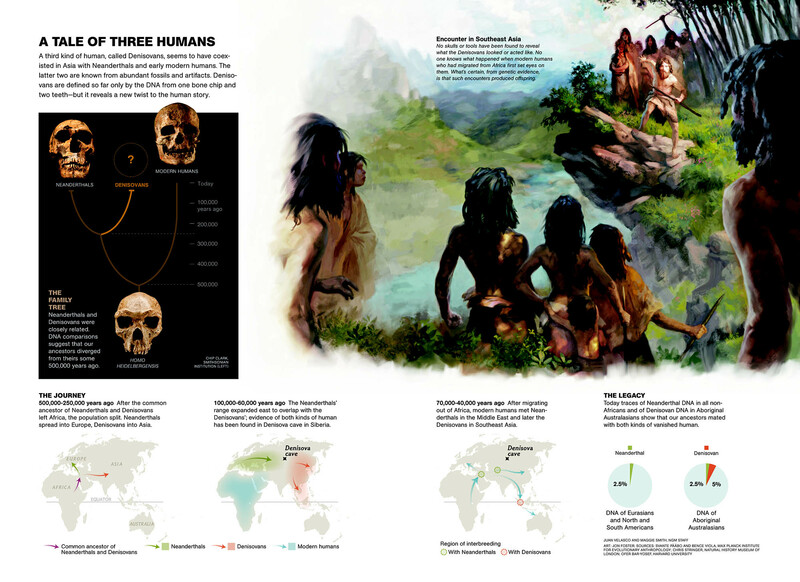 Get to know your “Hominin History” with our fun GeoStory. Behold Denisova Cave, the only documented home of the Denisovan branch of the hominin family tree. 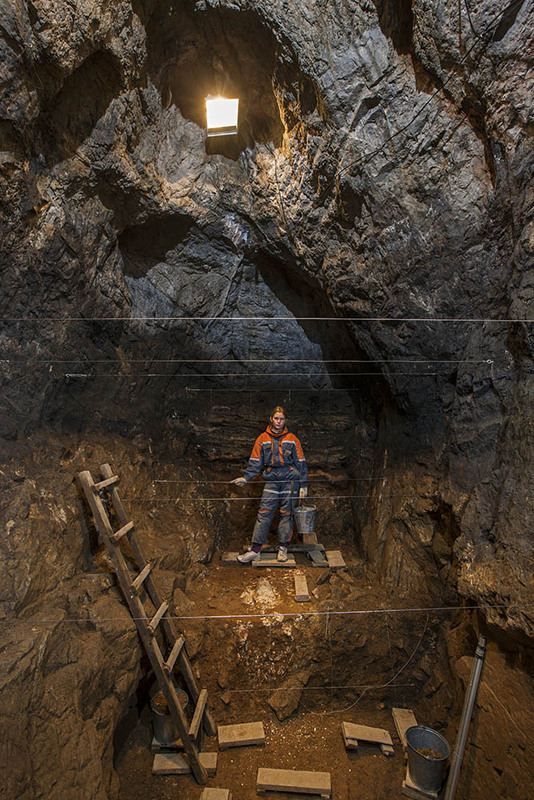 Archaeologists extracted Denisovan DNA from the dirt of this cave. A genuinely exciting new study documents how scientists extracted ancient DNA from the dirt of ancient caves. What is DNA? DNA (deoxyribonucleic acid) is a molecule found in almost every living organism. DNA contains specific genetic information about that organism. Most DNA is located in the cell nucleus (where it is called nuclear DNA), but DNA can also be found in the mitochondria (where it is called mitochondrial DNA or mtDNA). In this study, researchers analyzed mitochondrial DNA. “Unlike the rest of our genes, mitochondrial DNA is inherited only from our mothers—and it generally doesn’t undergo recombination. Even though hominin mitochondrial DNA is made up of more than 16,000 individual genetic ‘letters,’ constituting 37 different genes, in terms of inheritance, it behaves more like a single, extremely short gene. Mitochondrial DNA is inherited as a single unit without being broken up.” This makes it really, really valuable to geneticists. From cave sediments, researchers extracted the DNA of Neanderthals and Denisovans. Who are these hominins? Take a look at the graphic above for some help. Neanderthals and Denisovans are both extinct species related to us—modern humans (Homo sapiens). Fossils and tool evidence of Neanderthals have been found throughout Europe and Central and Northern Asia. Neanderthals coexisted with ancient Homo sapiens. We know this because today, most Europeans and Asians have between 1% and 2% Neanderthal DNA. Fossil evidence of Denisovans has only been found in a single location, Denisova Cave in Central Siberia, Russia. Like Neanderthals, Denisovans also existed with ancient Homo sapiens. Today, most Melanesians and Aboriginal Australians have about 3% to 5% Denisovan DNA. Extracting DNA from dirt is a breakthrough. How do archaeologists, paleontologists, and geneticists usually obtain DNA from Neanderthals, Denisovans, and other ancient hominins? Click to enlarge! Sediment samples from seven ancient caves reveal a terrific assortment of mammalian DNA. By some accounts, the sediment study recovered a whopping 2.8 million DNA fragments. Only a fraction of those fragments (no more than 8,800) were of ancient hominins. Where did the rest of that DNA come from? Plants, other animals, fungi, microbes … Any living thing that was ever in those caves could have left DNA. How did ancient hominins leave their DNA in the caves? Mineral and organic components in sediments can bind DNA even as the source of the DNA (bones, blood, etc.) vanishes. Scientists knew where they were looking. (Caves can lack light, but the archaeology here was not a shot in the dark!) The 85 sediment samples were taken from seven caves where Neanderthals, Denisovans, and genetically modern humans lived for thousands of years. How might this method of finding DNA in dirt expand archaeological activities? The process could change how archaeologists excavate sites. “Save the dirt!” says one paleoecologist. What dirt are archaeologists digging up next? They’re going deep. The team that extracted the DNA from cave dirt is now sampling seafloor sediments off the coast of Great Britain, in search of ancient settlements that might have been submerged following the last glacial period. 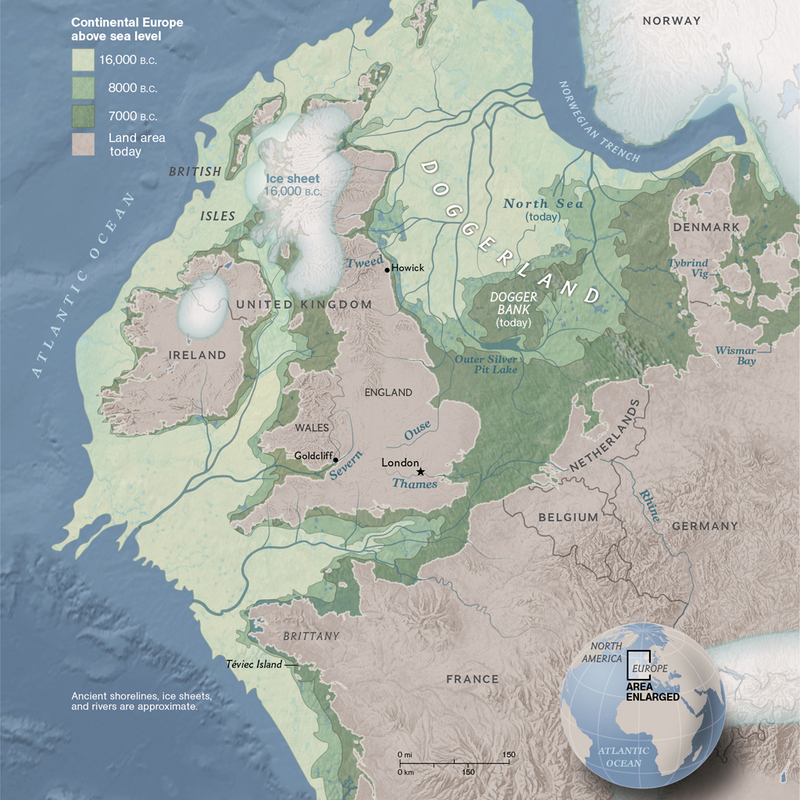 This beautiful map depicts what are now the British Isles and English Channel before sea level rise inundated low-lying Doggerland.